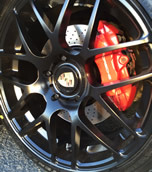 Full service multi-Piece wheel Sales, repair & refurbishing. We offer a vast selection including Asanti, HRE, Forgiato, Amani, Savini, Avant Garde, Vellano, Mht, just to name a few. 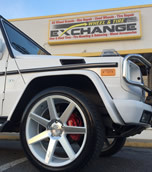 Vehicle Vinyl Wraps….the Wrapped Mercedes G550 above is a full color change including Rally/Racing Stripes. All Vinyl wraps and custom striping outsourced through the regions finest installers and is guaranteed. 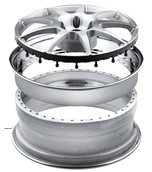 We offer a wide variety of rim repair, from bent as in the picture above to scrapes and cracks. All repairs are done in house and guaranteed. Take a look at our photo gallery below for additional pictures of damaged rims including before and after pictures. WTE offers brake caliper/rotor painting along with option slotted – cross drilled brake upgrade kits. Red and Yellow are the two favorite colors but many choices are available. 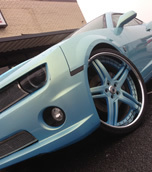 We can even color match with your vehicle. 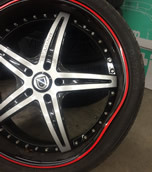 Add pop to your rims with color matching for your rims, or do a 180 and try our color contrast which…take a look at our photo gallery below for tons of pictures of our work with painted rims. Guaranteed fit with no creases or bubble, we use the finest wrap material for the smoke and many color options available.